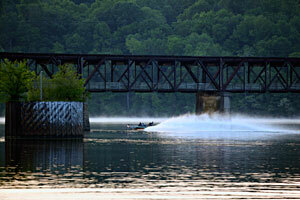 An Elite Series angler running under a bridge on Pickwick Lake practicing for the 2011 Alabama Charge. The windy search for big bass: Practicing on Pickwick and Wilson lakes early this week for the Wednesday-Saturday Alabama Charge out of Florence, Ala., Bassmaster Elite Series anglers were discovering that the bass do not have love on their minds. Good thing, too; if the high winds early in the practice session carry on through tournament time, sight fishing would be next to impossible. “Last year we were a bit later in the year and the fish were further along,” said Todd Faircloth, on a roll this season with a ninth-place standing in the Toyota Tundra Bassmaster Angler of the Year points race. He finished 27th in the 2010 Alabama Charge, which ran April 29-May 2. Pickwick is definitely a prespawn situation, Edwin Evers said from the water Monday morning as he fought the wind. On its website, the National Weather Service on Monday reported sustained winds of 25 mph with gusts of 41 mph in Florence. The service’s forecast for Tuesday included winds of between 5 and 15 mph. “Breezy” was the forecast for Wednesday and Thursday. While the wind is almost certain to be down somewhat, the water level is another matter, Evers said. “The water is really high, all flooded back up into the trees.” He estimated that the water was 4 feet above full pool, a result of recent upstream rains. Normally at this time of year, Pickwick is at winter pool, which is about 4 to 5 feet below summer pool. The lake level is controlled by a series of Tennessee River dams, but a deluge anywhere upstream in the watershed can bring a lot of water into Pickwick. Fluctuating water levels can change the bass fishing game not only overnight, but from morning to afternoon. Evers finished ninth in the 2010 Alabama Charge. He said conditions this year aren’t similar, so he can’t tap into patterns that produced a year ago. Many of the fish then were postspawners, but with water temps on Monday between 58 and 61 degrees, the spawn is yet to happen and probably won’t materialize by tournament time, Evers said. Like last year, one kicker per bag probably won’t be enough. Limits at last year’s Alabama Charge were plentiful; no pro failed to bring in five bass each day. But only those with multiple big bass populated the upper regions of the daily leaderboards. Leave Pickwick for Wilson? Both of the locks that connect Pickwick and Wilson lakes have been closed for electrical repairs but are expected to reopen Friday morning, according to B.A.S.S. tournament officials, who have been staying in touch with the Wilson Dam lockmaster. With Bassmaster Elite Series pros putting in at McFarland Park on Pickwick for the Alabama Charge, the lock closures put Wilson inside the tournament waters only on the final two days of the April 6-9 tournament. So anglers can opt for Wilson, but such a switch would be a drastic midgame change. During the Monday-Wednesday practice, anglers can scout the upper lake by trailering their boats to a Wilson put-in spot (although they must launch from McFarland Park during the event), but a dry run on locking won’t be possible. Edwin Evers is one angler who isn’t likely to opt for a trip through a lock. “If the lock were open three days, I might have considered it,” he said. According to the Tennessee Valley Authority, operator of the Tennessee River’s locks and dams, the main lock at Wilson is 110 by 600 feet. With a maximum lift of 100 feet, it is the highest single lift lock east of the Rockies. The auxiliary lock has two 60- by 300-foot chambers that operate in tandem. Fun in Florence: While Alabama Charge anglers are working on the water, fishing fans can be playing on shore. The fan fun will happen at McFarland Park in Florence, Ala., on Friday and Saturday, April 8-9, with most activities beginning at 1 p.m. CT. Highlights include the Eukanuba Super Dock Bass, Duck and Dog Village, an event brought to the park Friday and Saturday by the Super Retriever Series, a professional dog-jumping circuit. Spectators are invited to watch dogs run down a platform and leap into a 40-foot-long pool of water. Distance is the goal — the 2010 champion leaped more than 28 feet. The Super Retriever Series welcomes dog owners who would like to give it a try by signing their dog up for amateur division jumps. Preregistration is not required, and there’s a small fee. (There’s no admission fee to watch.) In a separate division, kids ages 15 and younger can enter with their dogs, and instruction will be provided. Also on Saturday, the final day, a free concert by The Decoys will begin at 1 p.m. and continue until 3 p.m. Local vendors will be offering arts, crafts, food and kids activities. The main events of the Alabama Charge are the Elite Series weigh-ins at McFarland Park, Wednesday-Saturday, April 6-9. They will begin each day at 4 p.m. CT.
All Alabama Charge events are listed online at Bassmaster.com. Who’s next? This season for the first time, the winners of pro events instantly qualify for the 2012 Bassmaster Classic, set for Feb. 24-26 out of Shreveport-Bossier City, La. With three pro-level events in April, that means three more Classic spots will be filled this month. First up is the Alabama Charge, the April 6-9 Bassmaster Elite Series event out of Florence, Ala., on Pickwick and Wilson lakes. The winner walks away with $100,000 and a 2012 Classic berth.